Transformative learning involves experiencing a deep, structural shift in the basic premises of thought, feelings, and actions. It is a shift of consciousness that dramatically and permanently alters our way of being in the world. Such a shift involves our understanding of ourselves and our self-locations; our relationships with other humans and with the natural world; our understanding of relations of power in interlocking structures of class, race and gender; our body awarenesses; our visions of alternative approaches to living; and our sense of possibilities for social justice and peace and personal joy. 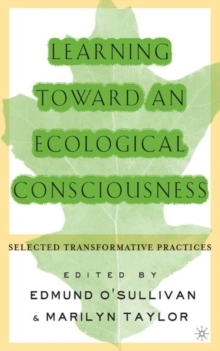 The editors of this collection make several challenges to the existing field of transformative learning - the first is to theoreticians, who have attempted to describe the nature of transformative learning without regard to the content of transformative learning. The editors argue that transformative learning theory cannot be constructed in a content-neutral or context-free way. Their second challenge, which assumes the importance content for transformative learning, is to educators as practitioners. The editors argue that transformative learning requires new educational practices consistent with the content. Arts-based research and arts-based teaching/learning practices are one example of such new educational practices. Education for the soul, or spiritual practices such as meditation or modified martial arts or indigenous peoples' forms of teaching/learning, is another example. Each article in the collection presents a possible model of these new practices. Pages: 266 pages, VI, 266 p.